I thought I was ready for our passage to New Caledonia. We stayed at a rocky anchorage the night before we left, I made plenty of passage food, I took pre-emptive sea sickness meds and I was reciting all my usual positive pre-passage sayings! Passage Food Meals! Mac & Cheese; Lentil Stew! Yummy! The one saving grace was our cockpit side covers. We would have been completely soaked without them. I felt pretty green instantaneously and puked that evening. Lovely....I was definitely cursing all this sailing bologna. 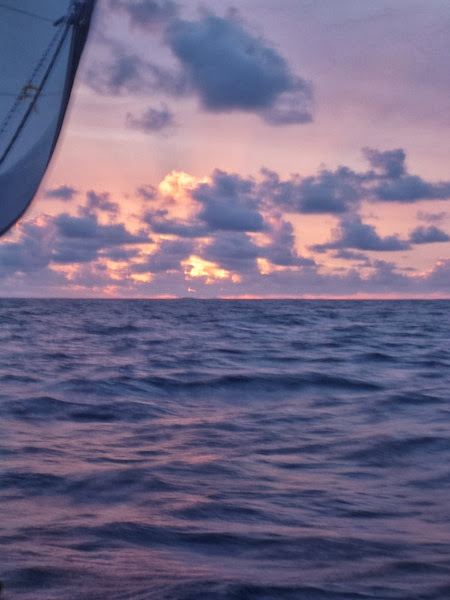 The next day the seas calmed into beautiful gentle rollers and the wind subsided to 15 knots. Starship was gliding effortlessly towards New Caledonia under bright blue skies. The next four days continued to be the best sailing of our lives. I could cook, read, do computer work and still felt amazing. It felt like a vacation with Chris and I lounging in the cockpit.The night watches were even enjoyable. The sky was clear, I was seeing shooting stars and I loved listening to Vinyl Cafe as I dreamed about our future in Canada. All in all a wonderful 5 day passage to New Caledonia, where we treated to this beauty the night we arrived. Thank you sailing gods for giving us one easy passage during this South Pacific. Here's to hoping we have one more!